Paid parking is available in the street. Please for further queries contact us at our email address. Tendido Cero was our second project of Cambio De Tercio Restaurant Group, opened in February, 2001. It is located in the heart of Chelsea-South Kensington, just opposite to Cambio De Tercio. It’s all about Wonderful Tapas here, small dishes of traditional and modern recipes from our rich Spanish gastronomy, which are ideal to be shared by the whole table. Busy and buzzy, with vibrant bullfighting colours and a party feel atmosphere that makes it a deal for any celebration. What really makes Tendido Cero a nice experience is the great service and genuine smiles from the staff. That and the great food of course. Lovely food, portion size varied, great service from all staff. Great venue. Looked after very well, especially thankful the ice pack for my wrist having fallen over on my way there, subsequently found to be broken. Will return for sure. Did not like the staff attitude in regards to the sitting. Very rushed and not welcoming. We arrived a little later than 7.30 but called the restaurant. Our food arrived too fast. At one point I was still eating with my fork in my hand and my plate was taken. My partner was told to but food on his plate so they could remove a plate and bring another tapas. There wasn’t time to enjoy the food at all. When I tried to slow things down a server would come over and ask is everything was ok..this happened at least 6 times. At 8.45 we were told they needed the table and would move us to the bar if we wished to continue eating. No one else was at the bar. I asked for an espresso and the waiter just shook his head no. Although he did bring it reluctantly. By 9pm we were walking home. Such a shame that our night was deemed less worthy than another booking. Perhaps as we were two and the booking was large. The food is good here as are the staff. I just left feeling let down and underwhelmed. It’s not cheap. Still the best restaurant in London. My favourite. Unbeatable customer service, nicest staff and incredible food. Worth the prices. This was my second visit to Tendido Cero. My first visit would have been 5 start across the board. Sadly, this second trip must have been a bad night. The bottle of wine we ordered was "out of stock", just annoying. While many staff are around, our main waiter was disinterested at best. He was was unable to make recommendations let alone describe the dishes on the menu. Nice ambience and great menu did not out weight the cold service. First time back to tendido in a few years. The food quality has gone down. Within moments of ordering, food was dropped on the table making me question how fresh cooked it was. The bread was warm on the outside but cold on inside indicating it was premade and frozen. Not worth the money spent. The service was good although we were pushed to leave several times during the meal. The waiter / host was very good. One of the best tapas restaurants in london ! There’s always something new to try on top of the regular menu items which are delicious. The ingredients are top class and always fresh. Interesting from time to time but food very salty and heavy - we all suffered from heart burn afterwards! As usual a very pleasant experince. Food is delcious, seevice excellent. A bit noisy. I will continue to come to this excellent Spanish restaurant . Remains the best Spanish restaurant in town! Always reliable, one of our favourite spots. The food is delicious, wine list extensive, service efficient and friendly and the atmosphere is lively whilst not being so loud that you can't have a conversation. I go to this restaurant regularly. The food is always excellent and the service fantastic. I love sherry and they have a good selection. The garlic prawns are a must as well as the asparagus. There are regular specials too. Strongly recommend. Really enjoyed our late lunch for a borhdyanof my 19 year old son. Authentic food, cosy, great service. We were so happy to see it re-open. Both Tendido and its sister restaurant across the road are great! Food quality, variety of wines, friendly staff and relaxed atmosphere. Its a family favorite! Excellent Tapas in a modern setting. Friendly and attentive service. Amazing! Such good food. Modern spin on tapas. Even the spicy potato bravas were special. Lamb cutlets, oxtail, scallops and octopus were the standout dishes. Would go again and again! Have been to this family of restaurants many times and always loved them. Tonight was disappointing. The food was cold. We were served the wrong thing twice. We were rushed off of our table. It was not the usual quality of food, service nor experience. The most amazing gin menu and cocktails! Our server was amazing - giving us plenty of attention, recommendations and advice despite having a party of about 20 to wait on, too. Year after Year Tendido Cero and it's sister restaurants along the Old Brompton Road win us over with their phenomenal food, great service and exceptional quality of ingredients. A rare continued success story in London's busy restaurant scene we have enjoyed many evenings in this great restaurant and I can only highly recommend their Tapas and extensive Spanish wine list. The list of highlights from their seasonally changing Tapas Menu is too long to mention here but it is definitively worth paying for their somewhat pricier speciality hams and seafood dishes. We had to go across the street to their other restaurant since it was under renovation but we got the same menu and the food was fantastic and the service superb. Our server was fro Spain and had excellent recommendations. 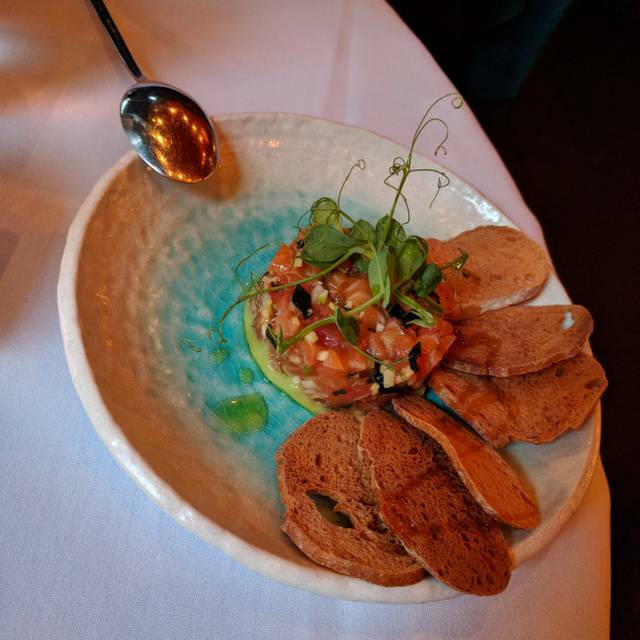 I really liked the salmon tartar and my husband's favorite was the chorizo. There were many other authentic dishes that reminded me of our trip to Spain. For an evening I felt like I left London and was dining in Barcelona. The Tendido is under construction, so we had to go to the sister-restaurant across the road. The prices do not represent the quality of the food. On average it is a good place, but a bit too pricey for what you get. The restaurant is being refurbished and customers need to go to their sister restaurant across the road. Poor signage telling you such, nearly went home. They then give you two menus one for each restaurant. One expensive and one reasonable which suddenly became the most expensive tapas ever. I haven't been to Tendido Cero for seven years. What a waste of many opportunities. It is as good as it has ever been. From a hasty and gracious change of table to the super-attentive service and wonderful tapas. I won't be waiting another seven years. Staff was great from the time we entered to the time we left. Took extra special care of my nieces with some adjustments to their meals. No complaints on any of our courses. Added touch was that my niece went to the washroom and at that same time they had a power glitch and the place went dark and she got scared and tried to get back to the table. Was in tears cause she panicked. Staff felt so sorry for her they brought her some chocolate truffles and caramel to sooth her discomfort. It helped. Will definitely be back to this restaurant and would definitely recommend it. Always amazing, the best patatas bravas in london! We ate here last Friday evening on the recommendation of a friend. The food was very good, tasty with fresh ingredients. I will certainly return in the future. The service was excellent. The food was very good and the service outstanding - cannot recommend highly enough.